Hydraulic Mining, North Bloomfield company at the Malakoff Diggins. Photo: Carleton Watkins/Bancroft Library, 1871. James Marshall first found gold when constructing a mill for John Sutter with the help of Maidu workers in the Sierra Nevada foothills, now known as the Mother Lode, or Gold Country, in California. Although Marshall initially claimed that he found the gold, he later admitted that his workers had helped him. Apocryphal stories suggest that a man named Indian Jim actually found the gold in the Coloma area. Sutter was initially willing to recognize the Maidu claim to the land. He drew up a treaty to lease the land from the local peoples, offering them 150 dollars a year for the rights but the treaty was rejected by the governor of California who explained that the United States did not recognize the Native title. Some 4000 miners were reported prospecting for gold that summer, of whom more than half were Native peoples. This work was short-lived, as cheap, plentiful white labor came flooding into the area. Meanwhile the traders cheated the local communities regularly, offering to trade goods for an equal weight in gold. As the Native workers learned the value of the gold and began to demand just compensation, the store keepers invented a special "Digger Ounce" - a lead weight that was used to cheat unsuspecting Native peoples out of their panned gold. "When we began to find gold on the Yuber (Yuba) river we could git'em to work for us day in and day out, fur next to nothin'. We told 'em the gold was stuff to whitewash houses with, and give 'em a handkerchief for a tin-cup full," a white woman recalled of the first Gold Rush in 1848.8 One miner reported seeing a trader sell a local Native peoples a handkerchief and a string of beads for 500 dollars in gold. The Mother Lode was not the only gold producing region. Further south, Charles Weber, the founder of the city of Stockton, initiated the Gold Rush on the lands of the Miwok and Yokut peoples in the San Joaquin valley. The rush in these southern mines was led, however, mostly by James Savage who made treaties with the Yokuts in the winter of 1849. Savage, a linguist, learned the languages of all the local communities and married women from each tribe in order to establish a power base. Although he has been heralded as a friend of the Native peoples because of the treaties, he was also not beyond cheating them. He often charged the local people a pound of gold for a pound of sugar and sold beef, given to him by the federal government for distribution to the tribes, to the white miners. He also famously gambled away the gold that the Native miners entrusted to him for sale in San Francisco. 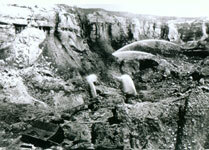 But the miners who followed Savage to the southern mines were not even interested in negotiating with the Native peoples as Galen Clark described: "Some of the Indian chiefs made the proposition that if the miners would give them some of the gold which they found in their part of the country, they might stay and work. This offer was not listened to ... In some instances, where the Indians had found and were working good mining claims, they were forcibly driven away by white miners, who took possession of their claims and worked them." This enraged many of the local peoples. Meanwhile, Savage's hired Yokut hands, like Jose Jesus and Jose Juarez were getting tired of the he constantly cheated them. Together with other Native leaders, they organized to attack Savage's ranch in December 1850 and kill three white men. The subsequent Mariposa War, led by Savage for the United States, took the troops on a chase that brought the first white men into Yosemite Valley in 1851 where they met the Ah-wah-nee-chee Miwok peoples. Chief Tenaya of the Ah-wah-nee-chee asked Savage to leave them in peace: "We do not want anything from the white men. Our women are able to do our work. Go then, let us remain in the mountains where we were born, where the ashes of our fathers have been given to the winds." To no avail, the white men stormed the villages in mid-May and forced the tribes to leave their lands and move to the reservations. In 1852 the Yokuts warned the whites to leave a trading post and ferry on the Kings River because these encroached on lands guaranteed to them under federal treaty. Savage backed the tribes. But Walter Harvey, a trader who was competing with Savage, took white volunteers to attack a Native reservation where they killed or wounded 27 of the residents. This humiliating defeat mad the Yokuts redouble their efforts to create an armed force to repel the white invaders. In 1852 Savage was asked to help the army in a display of force when the Yokuts met in war council at Four Creeks. In an unfortunate incident, Savage was killed by Harvey on his way to the site. With the loss of their ally, they Yokuts were slowly convinced to drop their hostilities and move to reservations. While the Yokut and Miwok were battling Savage, another Gold Rush was unfolding far to the north in the Redwood forests of the rugged mountain counties of the Klamath, Trinity, Shasta and Siskiyou, although the gold strikes in this region were poorer than those in the central and southern mines. This region was home to peoples like the Tolowa, the Wiyot and Yurok of the coast, the Chimariko, Hoopa, Karuk, Shasta and Whilkut peoples further inland, the Nomlaki, the Wiyot and the Yana in the south. Most of these communities were heavily dependent on rivers like the Eel, the Klamath and the Trinity for subsistence. To the east were the Achomawi and the Atsugewi, also known as the Pit River tribes. The name of the river is derived from local hunting practice of digging pits by the river banks and covering them with foliage to trick and trap deer. The northern Gold Rush was spearheaded by Peirson Reading in 1848 who brought with him Native workers from his ranch on the Sacramento River. The miners soon overran the local communities. Many of the communities were massacred, as explained in the subsequent pages, but others like the Modoc, fought back, until they too were forced to march to reservations. The final phase of the first encounters of the Gold Rush took place in eastern California when silver was discovered in the eastern Sierra Nevada ten years after the Œ49ers trudged over the mountains. Many of the new Californians headed back over the mountains where they clashed with the Numa and the Washoe peoples. Joaquin Miller, who lived among the northwest Modoc peoples, in the 1860's, described the reaction of Native peoples to the miners: "I have seen them gather in groups on the bank above the mines and watch in silence for hours as if endeavoring to make it out; at last they would shrug their shoulders, draw their skins about them, and stalk away. Why we should tear up the earth, toil like gnomes from sun-up to sun-down, rain or sun, destroy the forests and pollute the rivers was to them more than a mystery - it was a terror." Miller explained that the river mining had a major impact on the Modoc. "On the head of the Sacramento, before that beautiful river was changed from a silver sheet to a dirty yellow stream, I have seen the stream so filled with salmon that it was impossible to force a horse across the current. (Last summer the Native Americans were devastated by) the utter failure of the annual salmon run on account of the muddy water: the Klamath, which had poured from the mountain lakes to the sea as clear as glass, was now made muddy and turbid from the miners washing for gold on the banks." There were other terrors. The immigrants brought diseases like cholera, malaria, measles, smallpox, tuberculosis and typhoid, which killed an estimated 60 percent of the Native peoples. To add to the misery the acorn crop failed for two successive years. Andrew Freeman, and elder of the Nomlaki, another northwestern tribe, described the devastation: "No clover, no acorn, juniper berries or peppergrass. Nothing for three years. Finally the Indians got smallpox and the Indian doctor couldn't cure them. Gonorrhea came among the Indians. They died by the thousands." Some pleaded with the miners. "Some of the poor savages, who are now being hunted ... on the Humboldt trail, are begging of the ranchmen for permission to fish. They don't dare to fish, hunt or make fire without permission." But for most, the only way to survive was to raid white camps for cattle and food. The reaction to the cattle raids was quick and deadly. Angry settlers launched a series of attacks on the Native peoples.